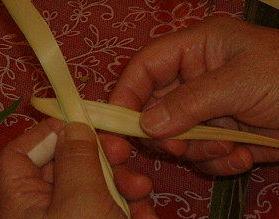 Remove the hard green edge from 2 palms and hold them at the base. To make things less confusing the palm on the right will be designated as palm X and the palm on the left will be designated as palm Y. Take the palm X and make a loop just above the base. Wrap palm X counter clockwise 180 degrees behind palm Y. This will make the loop of palm X be on the left side.